A Physician directed program designed and improved over the past 16 years to FDA proven to stop hair loss and regrow hair, help prevent baldness and thinning hair and to enhance your existing hair. Scientists and Doctors are coming closer to finding a cure for baldness. New Pharmaceutical thinning hair products, low level light therapy, better transplant techniques, cloning techniques, and altering a person’s genetic code are currently being investigated. These techniques hold promise in the future, but what about today? When you consider the drawbacks that accompany each new discovery, surely it makes more sense to prevent the problem from happening in the first place. This has been the focus of our research and development for the past 16 years, which has resulted our physician directed treatment program. How do I know if treatment is right for me? In order to find out if you are qualified for treatment, either an online or in clinic medical questionnaire must be filled out. Our medical staff will educate you on the basics of hair loss and will formulate a unique treatment plan taking into account the answers from the medical questionnaire. Not everyone is a candidate for treatment as some will not respond or have unrealistic goals. Our staff will answer any questions regarding how much is hair transplant, laser therapy and other solutions, as well as which treatment is right for you. Sometimes the best plan is either hair restoration surgery or hair replacement systems or nothing at all. All of these choices will be explained, as well as hair restoration cost, advantages, and disadvantages of each. Just call our office to schedule a consultation or fill out the online questionnaire if you live too far away. What is involved in a usual treatment program? Lifestyle and nutritional suggestions that will help you to maximize your individual treatment plan. Monitoring your progress with both a digital camera and a magnified capilloscope to show your improvement (in clinic only). What important things should I consider about product programs? All the products in a program were meant to work together from several fronts to maximize your results in stopping hair loss and getting re-growth. When using only one or two products, many people do not see the best results and therefore, do not continue treatment for a long enough period of time as it takes at least 6 months to a year to see results. When used individually and not in a program, products are more expensive and less effective. Only our programs were developed as medical programs by physicians with medical and scientific research. Many products offer hype, hope and huge claims without proof. Our programs were designed to maximize benefit and minimize cost. Our philosophy is unlike the rest of the hair loss industry-we believe in providing products and services that work at a reasonable price. 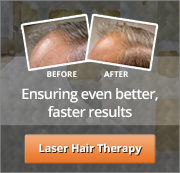 Laser hair therapy cost should not limit your options. To enjoy the maximum benefits from treatment, it is essential to use our Treatment Program Hair Care Products. What are some of the basic products? HairScripts™ Complete was clinically developed to help grow your hair stronger, fuller, faster and to arrest pattern hair loss in both men and women of all ethnicities. This product was developed as a one step oral solution to block DHT and give your hair the nutrients it needs to grow optimally. HairScripts ™ fights DHT (which attacks your hair) with an unsurpassed formulation of natural, anti-Androgenetic (DHT blocking) agents. Complete provides clinically proven hair growth vitamins, minerals, and nutraceuticals and has no side effects. This advanced herbal alternative to Propecia ® blocks significantly more DHT than other products and is so unique it is patented. Complete™ can even be used with Propecia® to enhance results. This product blocks DHT (which causes hair loss), similarly to Propecia® without the side effects. This product is safe and effective for both men and women and costs significantly less. Dexpanthenol dissolves sebum (which clogs hair follicles and hinders absorption of Minoxidil), promoting excellent scalp hygiene. This product also dissolves flaking and helps to minimize the symptoms of seborrheic dermatitis. Dexpanthenol is a key solution in your treatment program. This product is free of sodium sulfates and DEA, two harsh ingredients found in almost all commercially available shampoos that act like detergents and de-greasers and irritate your hair follicles. Scalp Scripts easily lathers, and gently cleans your hair without these harsh chemicals and is safe to use every day. Scientifically proven to stimulate new hair growth due in large part to its high percentage of panthenol and cysteine, a keratin protein which is in and of itself the basic protein found in human hair. No other company currently markets a topical hair growth nutrient product like Coenzyme. Carrier solution allows Minoxidil to work better. This product is the result of years of research and development, maintaining Minoxidil in a liquid state longer allowing it to penetrate down into the follicle where it will have the maximum effect on the growth of the hair shaft. Use of the carrier lotion allows you to use less Minoxidil and to significantly help absorption. Restores moisture to hair and scalp by acting as a moisturizer and conditioner and provides all the essential vitamins and minerals to the hair shaft. This product adds fullness and shine to all hair types.